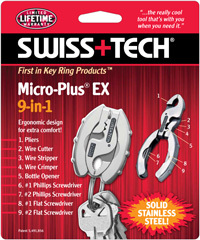 The Micro-Plus® EX 9-in-1 Key Ring Tool is a lightweight, pocket-sized, key-ring tool kit that includes pliers, wire cutter, wire stripper, wire crimper, bottle opener, #1 flat screwdriver, #2 flat screwdriver, #1 Phillips screwdriver and #2 Phillips screwdriver. 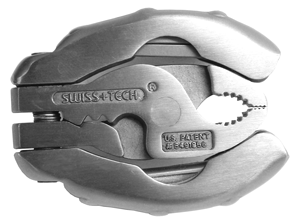 The ANSI standard screwdrivers snap into position with ease and change tips in seconds. 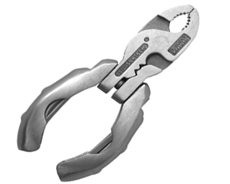 Open the pliers to use the wire cutter, wire stripper or wire crimper. 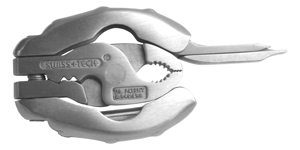 Open the pliers completely to use the bottle opener. 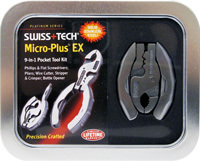 Like all Swiss+Tech tools, a patented quick release mechanism securely locks the Micro-Plus EX onto a key ring. 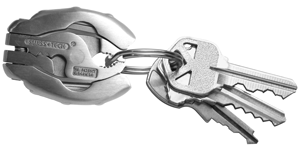 Solid stainless steel construction provides a lifetime of convenience, comfort and readiness. A constant companion that makes it easy to deal with life's mini crises! 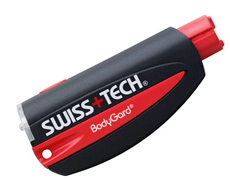 Everyday tools with anywhere convenience.